STICUPS, the ultimate portable magnetic cup holder makes its public debut at the 2018 Pirates Cove Fishing Tournament August 11-17th in Manteo, North Carolina. 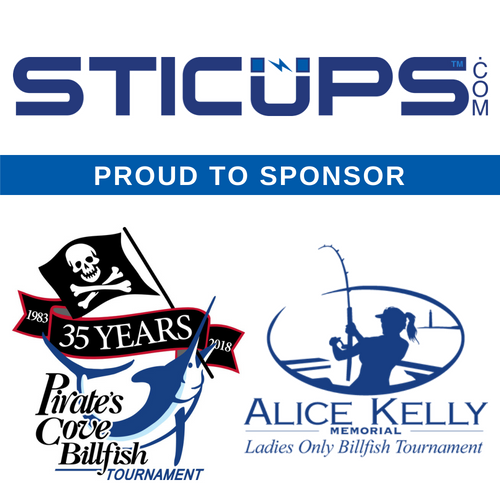 Innovative Products, LLC, maker of STICUPS is proud to be a sponsor of the 2018 Alice Kelly Memorial Ladies Only Billfish Tournament and 2018 Pirates Cove Fishing Tournament. STICUPS is the perfect mate for boaters and novice and professional anglers alike. There is nothing worse than seeing your favorite cup hightail it over the edge of the boat or suffering from a sticky deck because a soda or beer got spilled while fighting to get a place worthy catch into the boat. Let's face it, sometimes there just aren't enough cup holders on your boat and the options for adding additional ones are limited or require permanent modification by drilling holes. Behold, now there is a perfect solution...STICUPS, the ultimate portable magnetic cup holder. So what is a STICUPS? STICUPS is a very durable plastic ring that encompasses a super strong magnet that sticks directly onto the base of your favorite cup. It fit all standard cups including your favorite YETI® or Tervis®, metal or plastic koozie and more! On its own, STICUPS attract to any ferrous metal surface. But what about fiberglass, wood, glass or other non-metal surfaces? 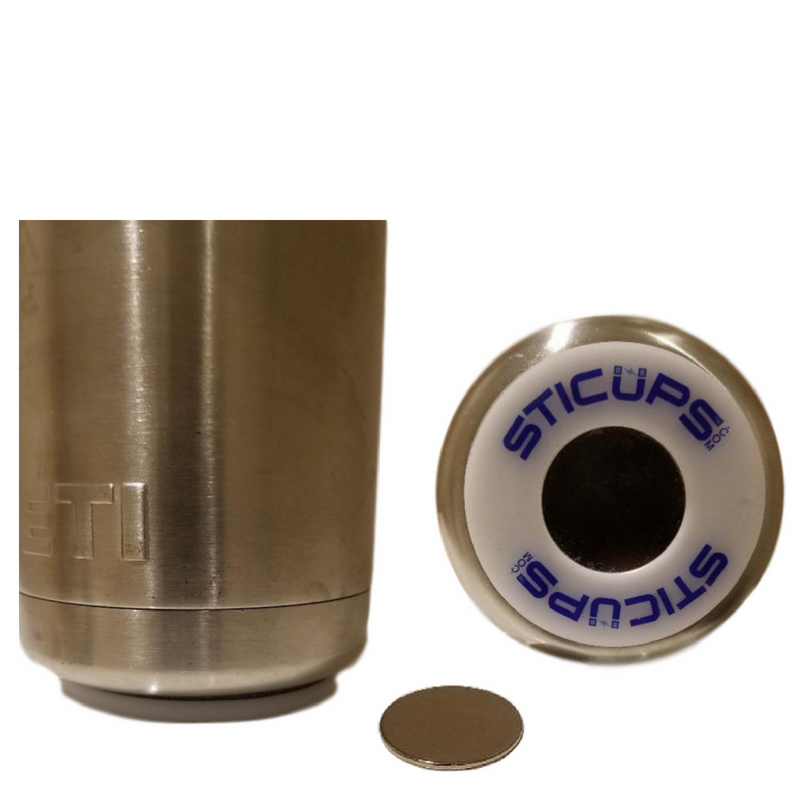 STICUPS has got you covered their too, just place the thin STICUPS super strong magnetic disc (included in the STICUPS Starter Pack), pre-loaded with a very strong adhesive, to any surface in any location you want your STICUPS to work. STICUPS work on just about any surface, at any angle, and fits on any standard cup, koozie or cup holder. STICUPS protect your drink from bumps, spills, knocks and waves so you can focus on other things and still keep your beverage close at hand. Mount multiple STICUPS super strong magnetic disc in any location on your r boat where a cupholder would be handy and easily move your cup from place to place with ease and piece of mind. Got a new favorite cup? STICUPS are resuable. It's easy to remove your STICUPS and relocate it on a new cup. Just grab some extra adhesive discs, available for purchase in our store, and you can reuse your STICUP and also move your STICUPS super strong magnetic discs to another location. Just think, with STICUPS there will be no more party fouls and your drink will stay safe and secure right where you left it! Get your STICUPS now...and grab one for a friend. STICUPS Starter Packs are now available in our store or on Amazon.com. Saving drinks since 2016, STICUPS Ultimate Portable Magnetic Cup Holder will be sure to eliminate serious party fouls and protect your drinks from bumps, knocks, spills and wave.